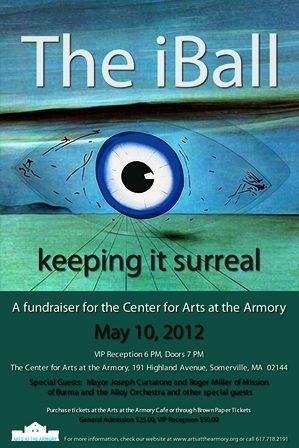 About the iBall: Join us as we create a surrealist experience for guests to celebrate the artist in all of us. Surrealist dress, music, cocktails and food will be on hand as well as the opportunity to participate in surrealist games and other madcap fun. A silent auction as well as a fashion show is part of the line-up. THe fashion show will be judged by the lovely Kyann Anderson and myself! Food has been graciously donated by The Foundry on Elm, Highland Kitchen, and Olde Magoun's Saloon! About The Center for Arts at the Armory: Ever want to know what is happening in the castle on Highland Avenue? Come check out your award-winning community arts center dedicated to promoting and celebrating arts and culture for residents of Somerville. Your support will help Arts at the Armory develop its programming to serve adults, children and youth. For More Information: Contact us! Arts at the Armory, 191 Highland Avenue, Suite 1-A, Somerville, MA 02143, 617.718.2191, info@artsatthearmory.org, www.artsatthearmory.org.